Product prices and availability are accurate as of 2019-04-20 21:58:38 UTC and are subject to change. Any price and availability information displayed on http://www.amazon.com/ at the time of purchase will apply to the purchase of this product. Compatible with the LG 28LN4500 28" inch LED HDTV TV/Television, this adjustable full-motion tilt/swivel black wall mount bracket puts the back of your TV 5" inches (127mm) from the wall when folded flat and 19.2" inches (488mm) when fully extended. This Full-Motion Wall Mount can easily switch between landscape and portrait orientation. 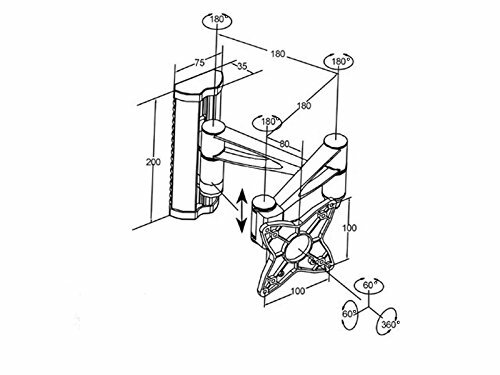 Additionally, the mount can be raised or lowered vertically along the length of the wall plate. 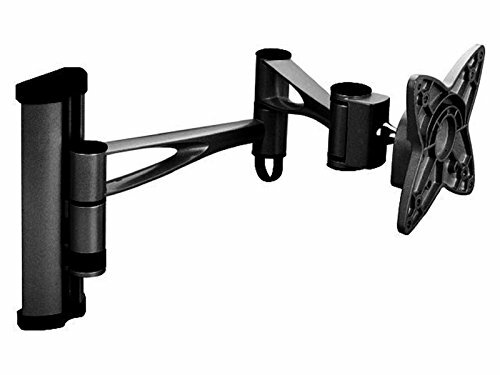 This Full-Motion wall mount supports most* 10" to 27" LED/LCD/Plasma TVs weighing up to 33 lbs and features a 60 Degree continous tilt that alows easy viewing from any angle. Its simple to align single bracket makes installation quick and easy and it can be mounted to a variety of wall constructions including wood stud, solid block, or concrete. It is constructed of Aluminum and Plastic with a durable scratch resistant black finish and comes with all mounting hardware and simple to follow installation instructions. *Mounting holes on television should be 75 x 75mm (3" x 3") or 100 x 100mm (3.9" x 3.9").